Students had the chance to “surf” an inflatable wave while enjoying treats and friends as “Homecoming at Sea” activities got under way this week. Photo by Parth Moody. 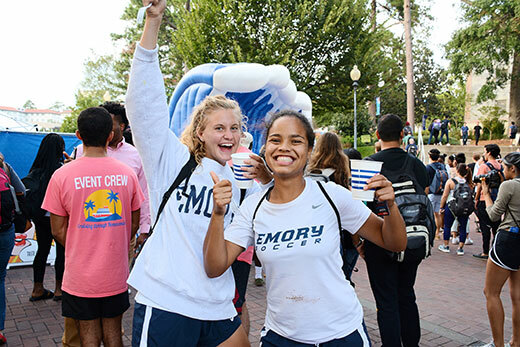 Emory’s Homecoming celebration continues throughout this week, with a diverse slate of events for both current students and alumni, as the university also welcomes students’ loved ones to campus for Family Weekend. The convergence of Homecoming and Family Weekend brings a calendar packed with musical performances, tours, lectures and social events, culminating on Saturday, Oct. 20, with the Homecoming Parade, Festival and Concert featuring singer-songwriter, Oxford alumna and Decatur native Keri Hilson. Many events are open to the entire Emory community, including faculty and staff, although registration may be required. “Homecoming at Sea” is the theme for student events planned by the Student Programming Council. On Wednesday, Oct. 17, enjoy Wonderful Wednesday After Dark with a Game Night at 6 p.m. on Cox Bridge. Festivities for Thursday, Oct. 18, start at 11 a.m. with "Decks, Dealers and Dooley: Casino Day" sponsored by the Residence Hall Association in conjunction with Homecoming. Then it's HocoFest, a Homecoming festival on the Glenn Memorial lawn at 5:30 p.m., followed by an 8 p.m. performance at Glenn by comedian Beth Stelling. On Friday, Oct. 19, there'll be a 6:30 p.m. dinner at the First-Year Quad. The Homecoming Ball will be at 8 p.m. on the Quad. Rappers Waka Flocka Flame and Ugly God have been announced as the headline performers. On Saturday, Oct. 20, the Homecoming Parade begins at 1:30 p.m. on the Quad. The festival starts at 2 p.m. on the Quad, as the Student Programming Council and the Emory Alumni Association present Keri Hilson as the 2018 Homecoming headliner. This year, the SPC will hold a raffle for Homecoming Week. Those who come to five Homecoming events during that week will be entered into a raffle to come on stage during the main concert and help SPC throw t-shirts to the crowd. Get a card at various SPC Homecoming events; get the five punches for the events and you will be entered into the raffle. The TechLab at Cox Hall Computing Center also continues its workshops to make themed accoutrements to help celebrate Homecoming. Friday, Oct. 19, offers a variety of opportunities for learning, networking and reconnecting, along with some beautiful music. At 1 p.m. participate in a class and panel discussion featuring Emory Nursing alumni leaders with “The Journey to Nursing Leadership Alumni Panel.” This will be held in the Nell Hodgson Woodruff School of Nursing Auditorium. There is no charge. Contact Megan Lennox for more information. Saturday, Oct. 20, includes a full slate of events as well, highlighted by the Homecoming Parade at 1:30 p.m. and the Homecoming Festival and concert with Keri Wilson starting at 2 p.m.
At 10 a.m., join a panel of legal scholars from Emory Law to explore “Constitutional Law & The Presidency.” The free event takes place at Gambrell Hall at the School of Law. After the Homecoming Concert, enjoy more music as the Emory University Symphony Orchestra performs with tango musicians Sonia Possetti and Damián Bolotin, who have served as artists-in-residence at Emory this week. Free tickets are required. Events wind down on Sunday, Oct. 21, with worship services, a free 4 p.m. concert by the Emory Wind Ensemble at the Schwartz Center for Performing Arts and a free 4 p.m. jazz family concert with the Gary Motley Trio at the Carlos Museum. Running parallel with Homecoming is Family Weekend with special sessions to let visitors get to know Emory better. Many events are considered part of both Homecoming and Family Weekend and are open to families, students and interested alumni. Participants can attend sessions throughout the weekend on career center services, study abroad opportunities, undergraduate research, mental health and crisis services, student housing, pre-health advising and more. While there is no charge for these events, registration is required. Topics for the Emory College academic sessions include voting in a polarized era and media and the environment. There will also be a book fair with barbeque and brews at Goizueta Business School and the Emory bookstore Barnes and Noble will host a sweets social. In addition, there will be concerts, food trucks and other eating opportunities, a tour of Grady Memorial Hospital, a golf club scramble and other athletic events, and many more events and opportunities to reconnect and to meet new alumni and friends.